Orezona Building & Roofing was founded with the intention of helping homeowners resolve their roofing needs and problems. One of the most commonly sought roofing Corvallis, OR is roof replacement, which is why have dedicated our time, effort, and resources in mastering the art roof replacement and new roof installation for your satisfaction. Having the service of a residential roofing contractor here in Corvallis, OR and its nearby area is not like purchasing a finished product, like your computers or a vehicle. For unlike those things, a roofing project such as roof replacement requires the intervention of skillful roofers and not just machineries alone that performs critical factory operations. In view of such need of a professional roof replacement specialist for your residential property, Orezona Building & Roofing has carefully handpicked the members of our team of expert roofers, installers, artisans, technicians, and project managers. We consistently provide them with the latest trainings and equipment to keep them well-informed with the current advancements in the roofing industry to serve you well. Each of our roofing personnel is able to work on your roof replacement needs, regardless of its size and complexity. Whether you need asphalt or metal roof replacement, or any other type of roofing, you can always count on us to deliver. And if you are still confused on whether roof replacement is the perfect roofing solution for your property, here are some of the things to consider as part of your decision making. Age of Your Roof: If there is nothing wrong with your roofing system as you perceive it, you may still want to have a roof replacement project done because of your roof’s age. Most roofing materials come with a 20 year or more warranty, and if your roof is already passed the suggested usable period, then roof replacement might be the best thing to do. Aesthetic Decline: Curb appeal of your residential property is important, for it would somehow reflect your personality as a property owner. By simply noticing your roofing and comparing it with your neighborhood’s roofing systems, you may be prompted to decide for a replacement. 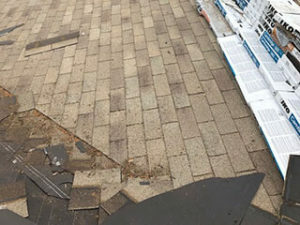 When you start noticing that your roofing is strikingly different in terms of appeal and structural integrity, you might want to consider a roof replacement, if not roof restoration. Energy Efficiency: Whether you like it or not, your roofing affects the energy efficiency of your home. You need to understand that a functional and efficient roofing acts as an effective insulator against cold and heat from the outside. If you have a poor roofing system, chances are great that you will have an imbalance in relation to your indoor thermal environment. Hence, causing for an increased use of your heating or cooling system, which will of course result to an increase electricity bill. Increase Property Value: Some of the reasons why property owners would like to replace their roofing even if it is still within the warranty period is for an increased property value. There are some roofing materials that are more attractive to homebuyers, such as asphalt and metal, primarily because of its durability, longevity, and flexibility. If you are planning to sell your property in the coming years and would like to get the best out of it, a roof replacement might be a good preparatory step to take. When it comes to your roofing needs, you should not simply rely on your own understanding. You should ask the assistance of a professional roofing contractor, be it with your roof inspection and roofing maintenance needs, or your need for a roof repair or replacement. To obtain the best roofing solution, you may contact us at (541) 204-1286 or visit Orezona Building & Roofing at 775 NW Kings Blvd Corvallis, OR 97330. You may also check us our Orezona Building & Roofing Facebook Page for more details. Contact us today!